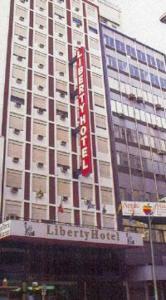 Liberty Hotel Buenos Aires, Buenos Aires discount hotels and accommodation. Liberty Hotel is placed in the commercial, financial, artistic, cultural and historic center of Buenos Aires City. It is only a few blocks away from La Bolsa de Comercio (Stock Exchange), the most important banks, The Colon Theater, Plaza de Mayo and the Cabildo. Also are very near two of the most important monuments; La Casa Rosa and Puerto Madero, recently reformed and modernized. View photos, room descriptions and make online reservations at Liberty Hotel Buenos Aires. Save on room prices at Liberty Hotel Buenos Aires, Buenos Aires.